Eastbam is back in Cambridge, at our basement bar. 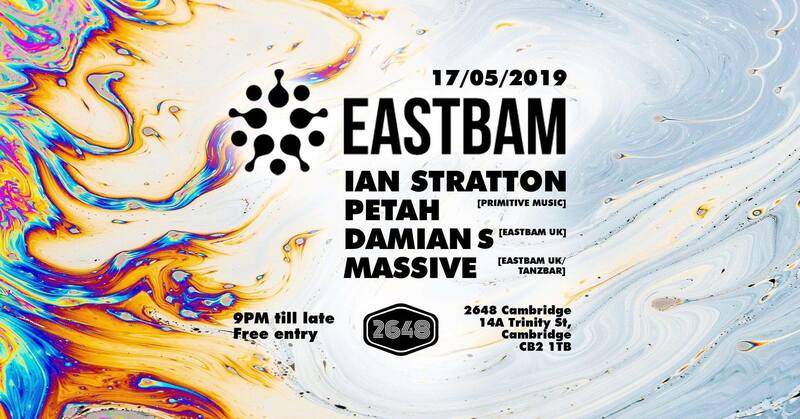 For your dancing pleasure we have chosen a couple of very talented local DJs Ian Stratton and Petah who will be playing alongside residents Massive and Damian S.
You can expect to hear deep house through to tech house with the Eastbam underground sound. We cant wait for this event. By submitting your information in this form, you acknowledge that you have read and understand our mailing list terms. You can opt out at any time via the unsubscribe link provided in the footer of every email we send or by contacting us at manager@2648cambridge.com.